Information on Samsung's metal mid-rangers is coming in thick and fast. Just yesterday we saw photos of the A3 and A5 in the flesh and now a benchmark for the Galaxy A5 has emerged, complete with detailed information on the specs of the device. The information, found on GFXBench, isn't a million miles from what we've heard before, but there are a few differences. For example it was previously believed that the Galaxy A5 had a 5.0-inch display, but here it's listed with a 4.8-inch 720 x 1280 one. The camera is slightly different too. That was rumoured to be 13MP, but here it's shown as 12MP, though the 4.7MP front-facing snapper more or less lines up with previous 5MP rumours. The biggest difference to what we'd heard before though is probably the processor, which was initially thought to be a Snapdragon 400 but is shown here as a 1.2GHz quad-core Snapdragon 410. That might not sound like a huge difference but the Snapdragon 410 has 64-bit architecture, while the 400 is only 32-bit. What that means is that the 410 can access more memory at once, potentially leading to improved performance, though on a mid-ranger with 2GB of RAM the difference won't be as marked as on a top end handset. The benchmark also revealed an Adreno 306 GPU, 16GB of storage, a 1080p video camera and that the phone will be running Android 4.4.4, though presumably it will get an upgrade to Android L at some point to make the most of its 64-bit capabilities. If you want some pictures to go with your stats then you're in luck, because some renders of the A5 have also emerged. These were sent to Phone Arena and show a metal-framed device which matches the other images we've seen. With all these leaks piling in we expect the phone will go official soon. 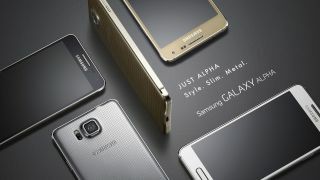 Samsung's metal dreams all started with the Galaxy Alpha.